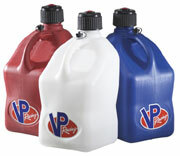 These 5 gallon VP Racing Fuel jugs are available in red, white or blue. The square design allows for better stability, especially during transportation. They are ergonomically designed for easy handling and pouring. Both the jug and vent caps are designed with rubber gaskets to prevent leaking. VP Fuel Jugs are made with non-breakable, impact modified resin. Each jug holds 5 gallons. These jugs have a square base approximately 12" in diameter and are 21" tall. The jug caps are multi-purpose in that they can be adapted to work with a hose (sold separately). Available in several different colors! Please specify color when ordering. Please Note: VP Fuel Jugs include the jug and vent cap. Adapter fuel hose (for pouring into small orfices), sold separately. If you race or just trail ride this is a wonderful fuel jug. Its made of very high quality material and will withstand any kind of punishment you throw at it.